The Environment Society of Oman (ESO), in partnership with Raptor Rehab in Bahrain, relocated and released three endangered Egyptian vultures from Bahrain. The birds were rescued from being held in unfavourable conditions by Raptor Rehab and Tails Veterinary Centre in mid-2017. They were kept in captivity and cared for in Manama prior to their release in Oman. The relocation was closely coordinated with local authorities such as the Ministry of Environment and Climate Affairs in Oman, the Ministry of Agriculture and Fisheries Wealth and the Oman customs. Free flights for both the vultures and the organisers were generously offered by Oman Air. 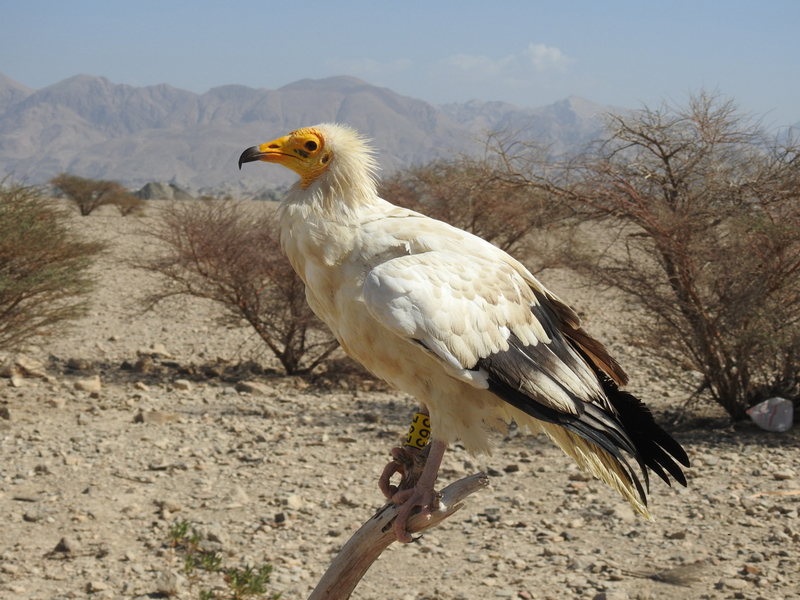 Oman holds a large resident population of Egyptian vultures, and is a wintering ground for migratory ones. Therefore, their release in Oman provides them with the best chance of reintegration into a natural environment. Egyptian vultures play an important role to the ecosystem, mainly as cleansing agents. Their scavenging behaviour prevents the spread of diseases and disposes of organic waste freely. The species has experienced a significant population decline worldwide due to an array of threats such as poisoning, poaching, electrocution and other forms of human disturbance affecting their nesting and breeding territories. Observations by the Environment Society of Oman suggest a stable population in Oman with numbers often reaching hundreds of birds in a single location. Maia Willson, ESO Research and Conservation Manager, said, “Through our partnership with local stakeholders, we have been able to successfully offer these birds an opportunity to once again live freely and take their place within Oman’s ecosystem. We released them in a safe environment, where direct threats are known to be minimal and food to be abundant. This will maximise their chances of successful reintegration. ”. A fourth vulture, which is a juvenile, was also released on the day after being rehabilitated at the Omani Wild Animal Breeding Center – Royal Court Affairs under the care of Dr. Barbara Golachowska. This vulture had been found to be in an unhealthy condition by staff at the Shangri-La Barr Al Jissah Resort and Spa in July of this year, and has since recovered. The Environment Society of Oman was founded with the objective of taking environmental conservation in Oman to the next level. Since its foundation in 2004, the society has created numerous campaigns and initiatives to spread the importance of biodiversity and educate residents on how best to preserve the Sultanate’s natural wonders. Next articleUnreal Bahrain: Let Bahrain Have Some Games!